The Gymnastics City USA Fan Fest at Arena Green builds excitement for the 2016 U.S. Olympic Trials for Women's Gymnastics focusing on the pre-event fan experience that brings together gymnastics fans, families and locals alike to engage in interactive activities, live performances and music creating a spectacular show and party-like atmosphere. Join NBC Bay Area at our live watch party following the fan fest on competition days (Friday 7/8 and Sunday 7/10). 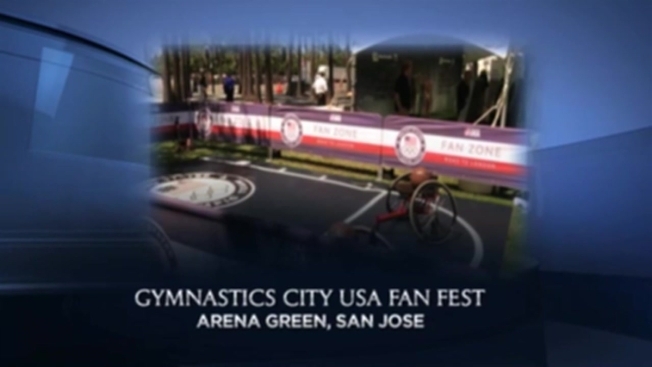 The Gymnastics City USA Fan Fest at Arena Green will be a lively and interactive celebration of gymnastics, the Olympic Spirit and the Summer Olympic Games in Rio. In addition to exciting sponsor and partner activations and giveaways, Gymnastics City USA will include free family-friendly programming such as DJ/live music, autographs, carnival games, food trucks and more! A "Fan Stage" will include programs such as Brazilian dancers, a Gymnastics fashion show, celebrity interview and contests. Doors open at 3 p.m. on Friday July 8, Saturday July 9 and Sunday July 10.